My Pink Castle Fabrics Blogger's Bundle has been sitting near my sewing machine for the last week or more. It has been calling my name. 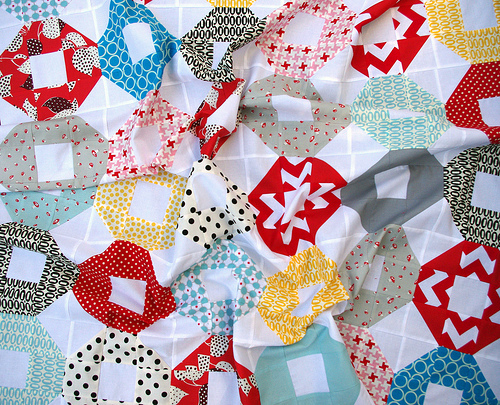 You may have already seen the red/white Chevron blocks made last week using two of the fabrics from the Blogger's Bundle, and so here is the rest. I am really enjoying how nicely these fabrics, colors, and blocks are coming together as work is progressing. I even love the blocks made from the black polka dot fabric on a white background; which I initially didn't think would work with this traditional block design. 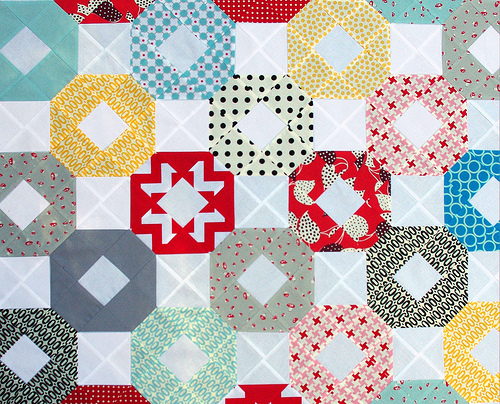 It is probably my favorite block now alongside the Chevron print blocks. It's back to the sewing machine for now. RPQ Blogger FQ Bundles - Iced Watermelon Shake - are available from Pink Castle Fabrics. The chevron blocks really pop! Love it. The chevron blocks look like snowflakes to me! Love them! The Iced Watermelon Shake FQ bundle is very nice. Like the colors. The chevrons are great too. My wife likes the Georgia quilt pattern on your blog page too. That is incredibly gorgeous! I love the way you incorporated those clever chevron blocks. Love the colors and the layout!! The chevrons look fanastic in this block! lovely as usual. I was wondering how you were going to use the chevron blocks. very clever incorporation. Clever use of the chevron fabrics! I love it! So pretty! Do you think you'd ever do a quick tutorial on this block? I'm a brand new quilter and LOVE this one! Boy, those chevrons really pop out! How fun! Especially love the brilliance of the chevron blocks! Have a super day! I love everything you do quiltwise. Those chevron blocks are AMAZING! I love them! That's gorgeous, Rita! I love all the prints together...and the amazing effect with the chevron fabric! Uh, YUM! This sends little butterflies around my stomach I want to make the exact same quilt! Hi Rita the lady above is correct, it happens to me too. But if I reply to you email they all show up. I love this quilt. The binding is perfect. You always do such an excellent job. 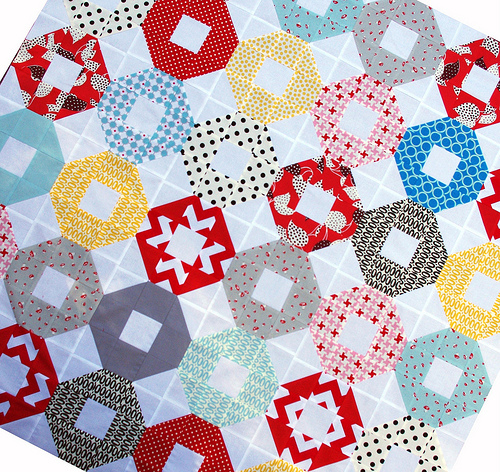 The colors play nice together and the blocks are cool.It's a Cool quilt.